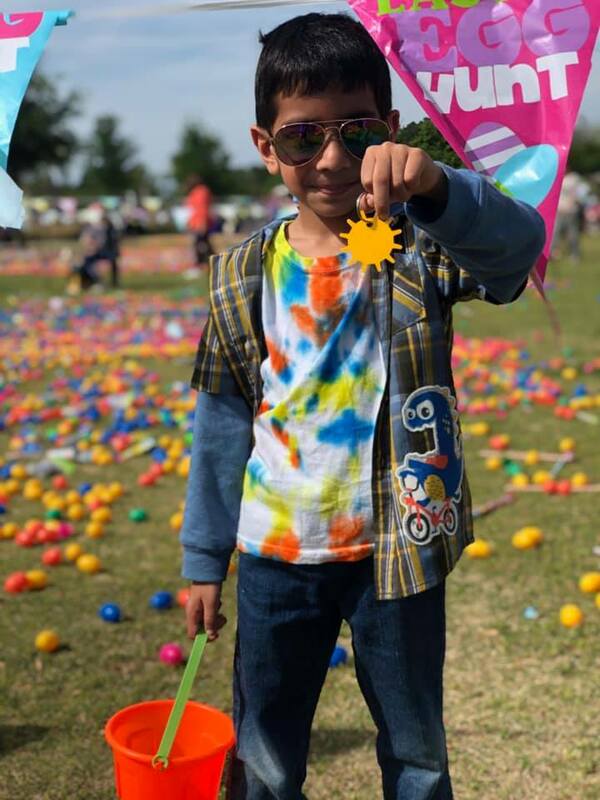 Our egg stuffing efforts finally came to a close on Saturday as The Island Recreation Center hosted their annual Egg Hunt for community children. You will recall that our adults began stuffing eggs last fall with the goal of completing 20,000 for this years hunt! We did it! 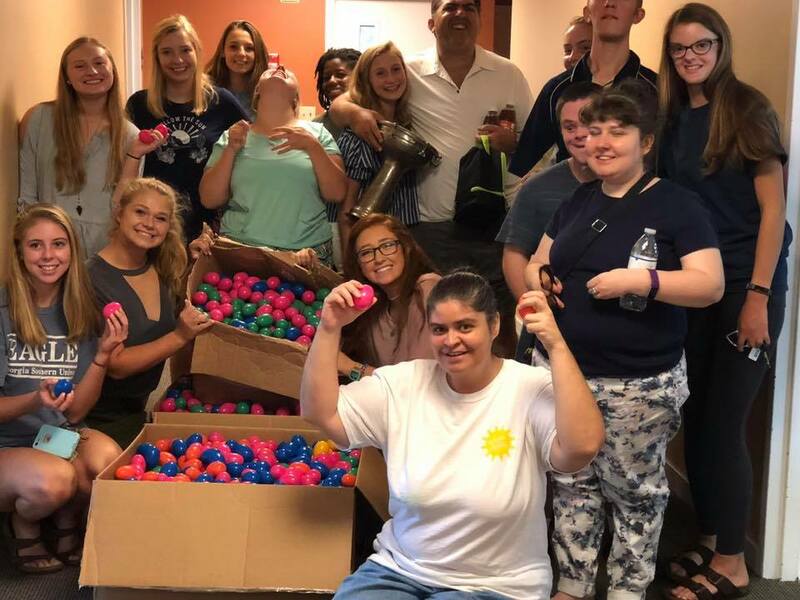 And are so very thankful for the community members who helped us tackle this feat by donating eggs, candy and taking the time to join us for the most fun egg stuffing parties around! We were very proud of our Rays and all their hard work and delighted to be able to take a group of them to volunteer at the hunt, truly bringing the project full circle and creating inclusion! The Rays created signs asking that participants recycle their plastic eggs so that they can be re-used for future hunts. They also manned our Pockets tent, handing out bags to hunt goers who came without a basket and assisting in any way they could. It was an eggcellent day to say the least! Thank you Hilton Head Island Recreation Center for providing our adults with this meaningful opportunity! If you are familiar with Hilton Head Island in April then you know all about the RBC Heritage Classic golf tournament. The tournament is loads of fun and popular with both golf aficionados and Island residents who love a good time! This year the tournament rolled out something new, a cookie contest! 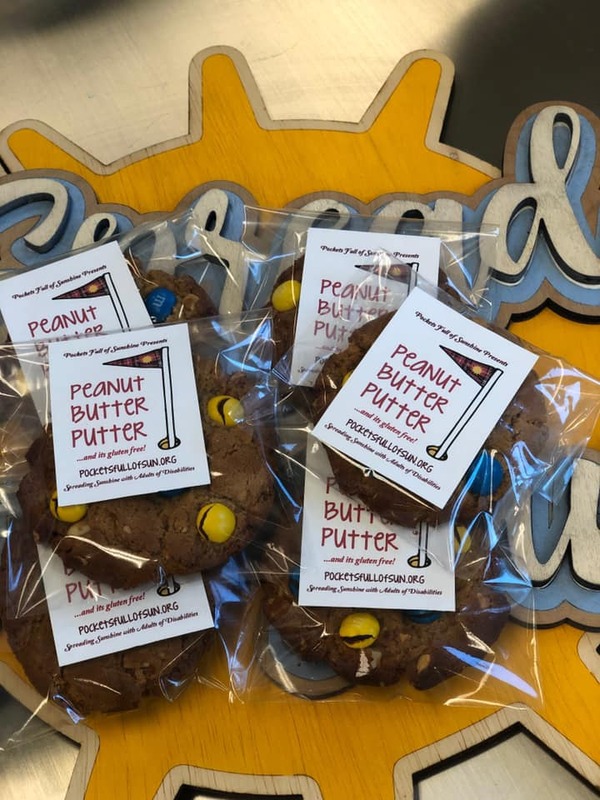 The Heritage Classic Foundation partnered with our local university, University of South Carolina Beaufort to host the first annual Plaid Nation Cookie Contest and find the tournaments official cookie! 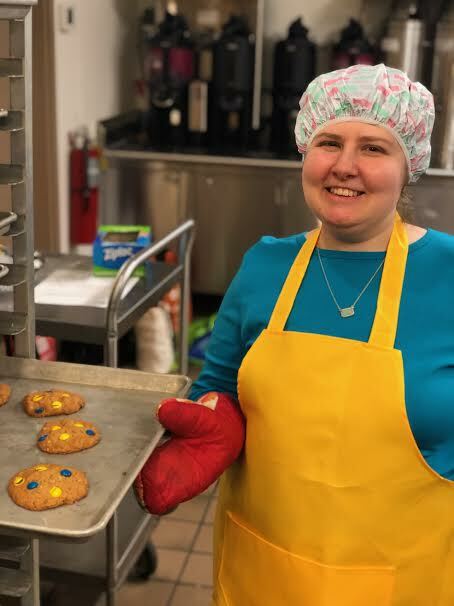 We thought this contest would be an exciting opportunity for our Rays and a great excuse to practice some functional skills in the kitchen…and eat cookies! We came up with our recipe, the gluten free but still delicious “Peanut Butter Putter” with RBC colored yellow and blue m and m’s. Our friend Chris joined us in the kitchen of First Presbyterian Church and we surprised the Rays with cheery yellow aprons! A day full of baking and fun ensued! Every adult had a job, and each equally important to the success of our recipe, be it sorting the M and M’s, stirring the dough or washing up after! There were countless opportunities to learn and reinforce daily living skills, all while having fun! We were thrilled with our final product and submitted it to the competition! Wish us luck! We held our 8th annual Sporting Clays Shoot on Friday, March 8th and were once again blessed by perfect weather and a wonderful event! The clayshoot is our only annual fundraiser and provides the bulk of the funding necessary to run PFS. It is an important day not only because of the necessary money it raises, but also because it showcases camaraderie and joy, values that help define our organization! This years shoot included a shotgun raffle, a delicious lunch, a great silent auction, a live wingshooting demo and a great after party following the shoot while scores were tallied. Once again some of our Rays attended the event and deemed it “The best day ever!”. I think many of the participants would agree! If you are interested in sponsoring or attending next years shoot in March 2020 contact us today! There is nothing better than a fundraiser that is actually FUN! And what could possibly be more fun than ice cream? We were so excited to be approached by our favorite local ice cream shop, The Ice Cream Cone to do an end of the season fundraiser. They agreed to not only donate their remaining ice cream to PFS but were also kind enough to invite our Rays to come in and scoop! This is exactly the type of opportunity we love, inclusive and a chance to practice functional vocational skills! We happily took over duty at The Ice Cream Cone with the assistance of their wonderful owners and it could not have been more fun! The ice cream was delicious and the Rays had an absolute blast working the counter and serving their friends, family and community members! Thank you Ice Cream Cone for thinking of our adults and creative ways to promote inclusion and give back to your community! This is what it is all about! Happy Holiday Happenings & End of the Year Wrap Up! Wow! What a wonderfully busy holiday season we had this year! We certainly ended 2018 on a high and are excited to see what 2019 will bring! Our adults participated in some wonderful holiday markets and festivals and we debuted our first original Sunshine Screen Print Product, An HHI Kitchen Towel! These were a great success and so fun for the adults to make, there will certainly be more designs coming next year! 2018 brought huge growth and many exciting opportunities for Pockets Full of Sunshine. We are ready to embrace 2019 and can’t wait to see how bright it will be! Happy New Year! This weekend Pockets Full of Sunshine had the chance to participate in a very special fundraiser. The Reebok Coastal Carolina Crossfit facility put on a RowRaiser to raise money for its exceptional crossfit class for adults with disabilities. Health and fitness is important for all of us, especially as we age, and it is even more important for our population of adults with disabilities who often have less access to physical fitness activities. Several of our Rays participate in this weekly CrossFit class and they all love it! Exercise and being with friends out in the community is good for both their physical and mental health! We sponsored a rower and got a team of adults and several of our wonderful volunteers and dear friends to participate in the event. As you can see from these photos there was a big turn out and a great time was had by all! It’s so nice to see the local fitness community supporting the local special needs community. Together we are all better! One of our favorite parts of living in the lowcountry is experiencing all the fun outdoor activities. The weather is beautiful for most of the year and you can enjoy it at an outdoor market or festival almost every weekend! This year we had the opportunity to participate in a very special new festival, the Bluffton Book Festival! Just as it’s name implied, the festival boasted lots of great books, meet and greet with authors and key note speakers, fun vendors and even a visit from world famous ballerina Misty Copeland! The Rays created one of a kind hand painted book marks and screen printed “book” bags in anticipation of the day. When festival day came in mid November, the weather was perfect and the day was a huge success! We can’t wait for next year! The Port Royal Sound Foundation held their first annual Recycled Art Contest this fall. The purpose of the contest was to bring awareness to Beaufort County’s plastic bag ban and to keep our local waters clean and healthy. The theme for the contest was anything related to the ocean and fun in the sun! We knew upon reading this description that this contest was right up our alley and our Rays went to work! Many hands helped and many Sundays were spent working on our piece, which we titles “Time is of the Essence”. It was made out of 99% recycled materials and depicted a giant hour glass with each side representing day and night. It was adorned with ocean animals who were picking up pieces of litter and filled with recycled bottle caps so that it became interactive and made sound when flipped over. We were thrilled with the finished product and even more thrilled when we received one of the 10 honorable mention awards at the ceremony! There were over 100 art entries, many of which were outstanding so we felt honored to have been chosen as a favorite! Art pieces are on display through December 31st at the Maritime Cultural Center in Okatie, SC if you would like to visit and see them for yourself! 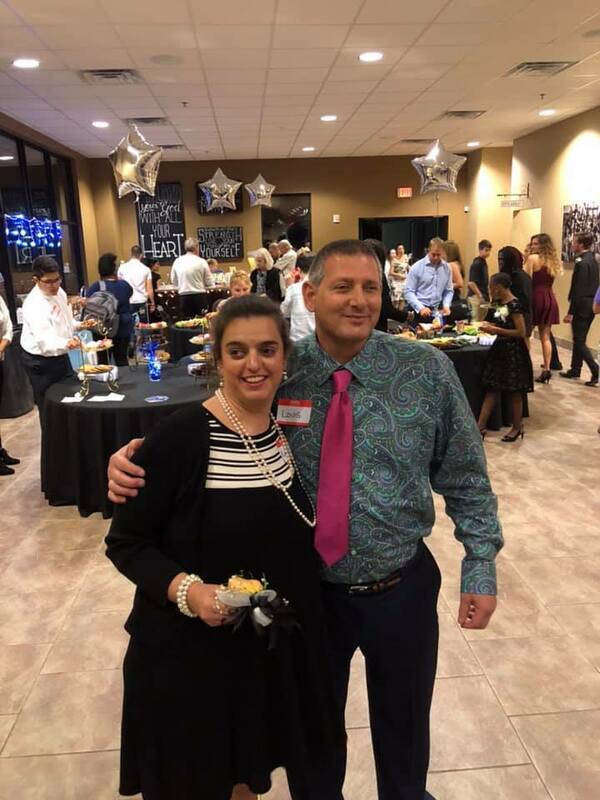 Remembering Hope and Introducing Mr. Dave! Halloween is always a special time of year for Pockets Full of Sunshine. October kicks off the holiday season which is always full of crafting, celebrations and lots of fun. One celebration in particular is always near and dear to our hearts, and that is Hope’s Halloween Party. Hope was a very kind and talented adult with special needs who passed away several years ago. Halloween was Hope’s favorite holiday and her mother Nancy plans a party for the Rays in her memory each year. They all look forward to dressing up, having fun with their friends, seeing photos of Hope and hearing stories about her from Nancy. All of the Rays also love to listen to Hope’s poetry which Nancy is kind enough to share with us each year. Hope was a very talented writer and illustrator! This year Hope’s party was made even more special by the addition of a special musical guest, Mr. Dave! Mr. Dave has been attending Pockets Full of Sunshine for the last few months and the Rays absolutely adore him and his guitar! They have memorized most of his songs and he has even written a few special songs just for the Rays! A session that ends with singing and dancing from the Rays and Mr. Dave is ALWAYS a good one! We are grateful to Nancy Anderson and David Carroll for spreading the sunshine with us! Even More Eggs....with the Zonta Club! Remember the 20,000 eggs the Rays are stuffing? Well we decided a party would help get us to the half way point…10,000 eggs! Our goal was to have 10,000 eggs completed by Christmas and while the Rays were dutifully working through them, we were starting to crack just a little (please excuse the bad pun!). Hilton Head Christian Academy Z Club to the rescue! We invited our Zonta Club friends to an egg stuffing party! The Z club brought toys for the eggs and helped our Rays knock out the final numbers to bump them to their 10,000 goal! We hope to have a few more parties in the spring to complete this project in the most fun and inclusive way possible! Thank you Z Club for always being such wonderful supporters and eggcelent friends! Back to School Screen Printing! It has been almost a year now that our Rays began working at local safety apparel business, TSA. The year has flown by and they have absolutely loved working alongside the TSA employees each week, completing office tasks like filing, shredding and unpacking boxes to count orders. Everyone has a favorite part of their job though right? For the Rays it is hands down screen printing! The Rays have worked hard to perfect the screen printing process with the help of the TSA employees and have even completed several jobs of their own! This summer we were given the opportunity to screen print t shirts for the Hilton Head Highschool PTO. The Seahawks t-shirts are sold in the school store and students are able to wear them in place of collared uniform shirts. As you can imagine, they are quite popular! Many of our Rays are themselves Hilton Head High graduates so this was a job they were very excited to take on. The Rays completed their first batch of shirts and were proud to hand deliver them to the school! They are ready for more orders! Have you ever heard the one about the woodchuck? How much wood could the woodchuck chuck if a woodchuck could chuck wood? I wonder how many Easter eggs a woodchuck could stuff? My guess is not near as many as our Rays! They have been working diligently on an exciting new project for the Island Rec Center. Earlier this year we were hired by the Island Rec Center to stuff 20,000 Easter Eggs for their annual community egg hunt. Yes, you read that right…20,000! This number seemed daunting until we got to work and were amazed as our Rays stuffed 2,000 eggs during our Sunday session. They were pros already! We will continue to stuff eggs with toys and later candy as we get closer to next Easter. We can’t wait for our Rays to see the joy on the faces of all the children during the egg hunt next year! We know they will take pride in a job well done! Fun in the Sun for EVERYONE 2018! There are few things in life that inspire joy more than smiling faces at the beach. When those smiling faces belong to people of every age and every ability, all having fun together, the joy is truly indescribable. This was exactly the scene I had the pleasure of witnessing on June 7th at Pockets Full of Sunshine’s 4th Annual Fun in the Sun for Everyone inclusive beach day. I have been in the unique position of attending this event all four years, watching it grow from just 25 participants to over 200 this year. The sun shines brighter and the joy gets bigger each year! 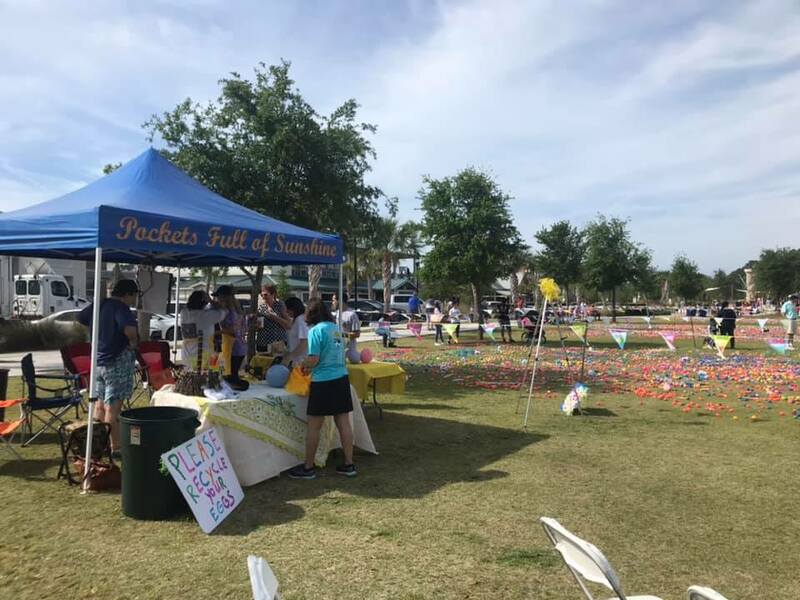 Pockets Full of Sunshine hosts the day of fun with the intent to bring the community together and provide a truly inclusive experience. Our belief is that everyone benefits when we all come together, those with and without disabilities. Looking around during the event you can literally see the benefits. New friendships are made in the sand, fears are conquered as a timid swimmer wades into the ocean holding hands with a volunteer, laughter is in abundance as a new surfer experiences their first ‘wipeout’, tears are shed as parents watch their children of all ages get to have fun just like everyone else. Magic happens at the beach, and this was certainly a day full of it. Our Rays have been working hard over the last year to create several annual crafts that are sure to be crown pleasers. Our sweet little recycled tree branch garden gnomes have been a big hit over the last two years, particularly the holiday version. The gnomes have become our yearly winter craft but we were still in search of the perfect summer version to accompany it. This year we were asked by our wonderful friends and supporters at the Wexford Village to participate in their Mother's Day Market, 'A Celebration of Women' to kick off the holiday and the opening of their summer Market. We knew we needed a great new craft product that would be beloved by the market goers and would be sure to make a special Mother's Day gift. Once again, we took our inspiration from nature and the beauty of our lowcountry landscape and decided to try a new craft with Oyster shells! The Rays had a blast creating these one of a kind mini oyster paintings and they loved the fact that just like us, no two are just alike! Like our gnomes, this craft presented a perfect opportunity for Rays of varying fine motor abilities to work together. We find that working with your friends is always the most fun way to create! The paintings sold so well that we have decided to make them our official summer craft! Be on the lookout for them (in two sizes!) at local events this summer and contact us if you are unable to attend but would like to own one of your own! This year marked the 7th Annual CRF Sporting Clays Shoot and lucky number seven it was indeed! We had a fantastic event! The sometimes unpredictable March weather was beautiful, the barbecue was tasty, the auction was busy, the smiles and laughs were plentiful and many a sporting clay was demolished mid-air! Thank you to all of our participants, volunteers and sponsors who helped to make this annual fundraiser a smashing success!